One of the best ever Bayern players. Lutte was long time Bayern captain, he was centre wing half. Very strong player with excellent heading abilities, very good passing range and made many assists for his strikers. He was good in defensive and offensive duties, defending, marking but also construction of attacks. Great athlete with good pace and quick burst. The friends of the sport Munich in 1927 has come to Bayern Ludwig Goldbrunner developed subsequently to Munich football idol. After a semi-final success with 2:0 goals against 1 FC Nuremberg in Munich, the set also in the final on 12 By June 1932 with the same result against the South German champions Eintracht Frankfurt. A repetition of this success to the outstanding defense managed conductors with excellent heading ability - Goldbrunner was for the KM system as created - not in its long activity at Bayern more. By contrast, he celebrated Gauauswahl of Bavaria in the competitions of the Association selections 1933 and 1940 titles profits. In 1939, he stood for a third time in the final, but this was lost with 1:2 goals against Silesia. From 1933 to 1943 played "Lutte" 16 games in the district competitions for Bayern. From 1938 to 1943 he practiced at Bayern from the post of player-coach. After the end of World War II from 1945 to 1949 he was engaged in the same function at the 1860 Munich and played in the Oberliga Süd in the round 1945/46 for the "Lions" seven games. From 1949/50, he trained the ASV Dachau and later came back to Bayern, where he was in the game Committees. On 19 November 1933 from Bayern Munich stopper made ​​his debut in the match against Switzerland in Zurich in the German national soccer team. With his performance as a center half in the 2-0 victory against the Confederates, he succeeds the Fürthers Louis Leinberger. As another debutant on Right Wing convinced the Augsburg Ernst Lehner. "Lutte" came on 14 January 1934 in a 3-1 win against Hungary for use and also participated in the World Cup course of 7 to 19 May 1934 part, but for the squad for the World Cup in Italy in 1934, he was not nominated. On 21 November 1937, Germany won the World Cup qualifier against Sweden in Hamburg with 5:0 and Helmut Schoen added two goals while the "Breslau-Eleven." Since the invasion by the German army in Austria 12 March 1938 "Anschluss" took place was, the unofficial international match on 3 April 1938 in Vienna under the worst possible conditions instead. The "Eastern March" won the match 2-0 with goals and poor coach Sepp Herberger was faced with the dilemma of on the fly from two completely different game systems for a team in June held FIFA World Cup 1938 to take shape in France. In the replay on 9 June against Switzerland - it was the 32nd National team of the Munich director - Goldbrunner represented as center half the German flag and fought duels with rapid Alfred Bickel, the young lieutenant of the Confederates. The team of Karl Rappan won the game with 4:2 goals and thus Goldbrunner difference from early in his second tournament. 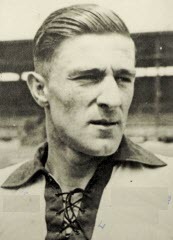 With the meeting on 20 October 1940 in Munich against Bulgaria, the captain passed with a 7-3 success and the 39th Use of the National Team. Up to his 70th Birthday Goldbrunner was a regular guest at the home games of Bavaria. Only to the derby with the "lions" of Munich in 1860, he did not go. After that age and illness forced him to his hobby as a spectator to watch the games to dispense. Lutte Goldbrunner died in Munich in 1981.